The Veritas Small Plow plane, made in Canada but referred to in England as a 'plough', is a welcome addition to the arsenal of high quality hand tools. This version I tested had five cutters supplied with it and I was able to work a variety of grooves quite easily. For those who dislike the noise and potential for losing control of a machine - this shouldn't happen but it does - the ability to cut grooves by hand should be very desirable. The plane is based on the Record No.44. It is easy to set up and the knurled brass knobs give crisp and accurate settings. Having chosen the blade for the width of groove and then fitting it, which is easily done, the depth gauge can be set. The deepest setting is 12mm (1/2in). The side fence gives a groove to edge measurement of 37mm (17/16in) but for ease of use, an auxiliary fence can be fitted. This will make register and square easier to achieve but will eat into the blade to fence dimension. I always start a new plane with zero blade projection and slowly advance the blade as I try the plane on the timber. This is slower than eyeing down the sole and advancing the blade until it 'looks right' but it is kinder to the tool and the timber. For this tool, set the blade projection to a comfortable cut and away you go. I found that holding the side fence with my left hand and resting my left thumb on the timber gave a robust and balanced feel to the plane in use. Starting at the edge of a board, I was quickly able to run an accurate groove. The plane can cut rebates and with a little care, can be used for stopped grooves, although other tools will have to be used to finish off the groove. I particularly liked the accuracy which I was able to achieve with this tool and I believe, if used in conjunction with chisels and scratch stocks, it is a very useful tool for box-makers. 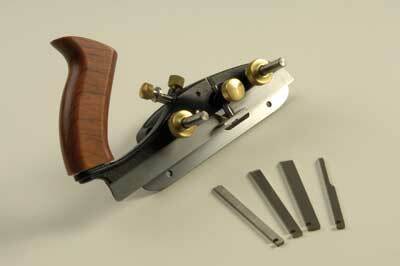 This plough was easier to use than my Stanley No.45 combination plane, which does the same job. 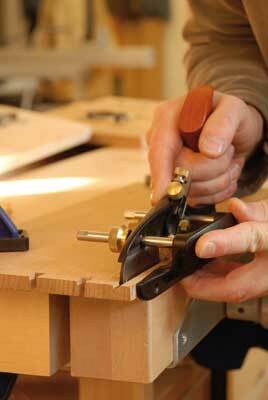 So all in all it is a worthwhile addition to a 'hand tool only' maker's kit. "I particularly liked the accuracy which I was able to achieve with this tool"